We are big Mo Willem fans at our house. 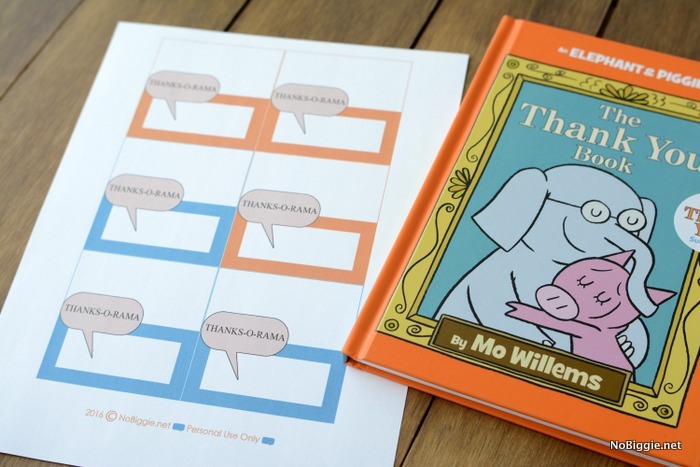 I’m teaming up with Disney to share with you the latest book from Mo Willems. From the Pigeon Books, Knuffle Bunny and the Elephant and Piggie books we love that Mo’s books are great for kids and fun for the adults to read too. 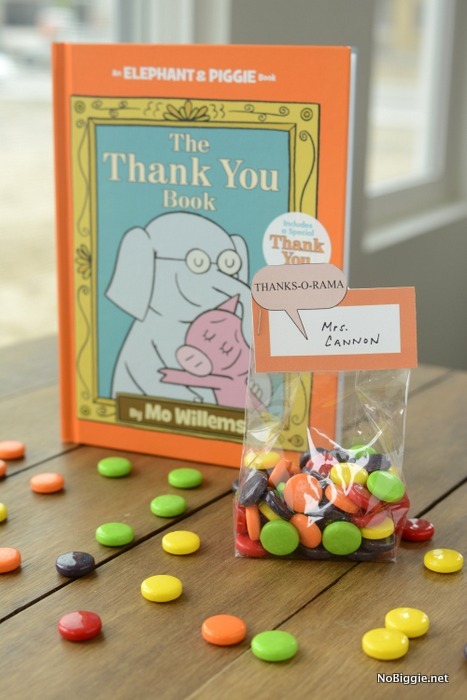 Mo’s latest book from the Elephant and Piggie series: The Thank You Book. It’s the final book in the Elephant & Piggie series. Or course it’s adorable, plus we love the message. It’s all about being thankful and letting those you love know how thankful you are. As the school year comes to an end, we have so many people to say thank you to. We created a cute little printable treat bag topper to go along with the fun message of the book. In the book there’s a line where Piggie wants to thank everyone, he calls it a “THANK-O-RAMA!” I love that line from the book. 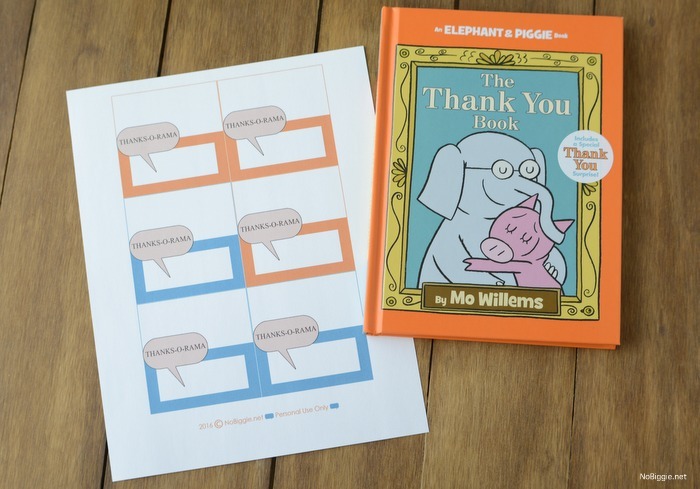 For the printable the tags read: “THANKS-O-RAMA” in a classic Elephant and Piggie speech bubble. There’s a spot to write in the name of the person or teacher you’d like to say thank you to. My son had a wonderful teacher this year. 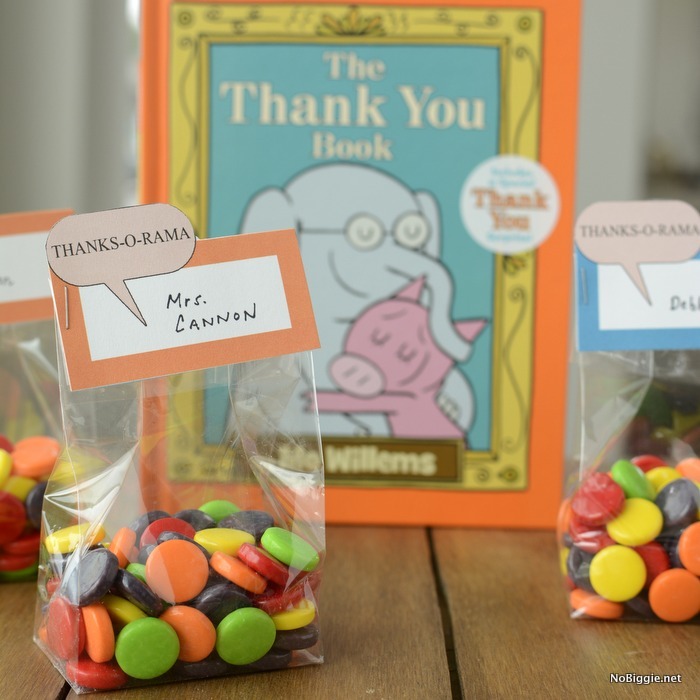 This printable came in handy as we said thank you at the end of the school year. We filled a little cellophane bag with some chewy candy and topped it with this fun treat bag topper. We’re so thankful for all the great teachers we’ve had this year. I hope this printable can come in handy for you too! This printable would work great at a birthday party as a cute party favor, it would also work at a bridal or baby shower. There’s always so many to thank! You can buy The Thank You Book here. Hi Jen! So sorry! The link is now working. Sorry for the delay. Thanks for letting me know!